Aghasi Abrahamyan agrees that time heals. But it could heal faster if living conditions were better. There is fact in the children's performance. Gyumri stayed true to its good traditions, which had nearly crumbled like the ground that disappeared under the feet of its residents on December 7, 1988. Meghvik was one of the first organizations to regroup after the earthquake with an apparent mandate to confirm that residents of Gyumri have borne up against misfortune. They continue to joke and it means they continue to live. Classic characters like Master Mukuch and Lover Onik are traditional for the city of song. One of the new characters is a prim and proper lady who came from abroad. She liked Gyumri so much that by the end of performance she decides to stay forever. Because there is a housing problem in the city and she doesn't want to spend money for a hotel she accepts the invitation of Master Mukuch to live with him. The more especially as he has put the eye on the lady since the opening act. The puppeteers include Lusine Zakaryan, 15, who lives alone with her unemployed mother and Aram Baghdasaryan also 15, who was six months old when the quake struck and is deaf as a result. Scriptwriter and director of Meghvik is Vehanush Hovhannesyan, who writes not only scripts but often music for performances. She says that every resident of Gyumri can relate to the script of this puppet performance. Young actors of Meghvik puppet theatre Lusine Zakaryan and Aram Baghdasaryan. "With the help of this performance we just try to catch the spirit of Gyumri residents, our traditions, manners and songs. And, of course, by all means we try to emphasize that Gyumri residents can overcome all problems," she says. Vehanush lost her parents in the quake. Concentrated on her own grief she was sluggishly reacting to everything happening around her. "I was 40 years old by that time but I took the death of my parents very heavily. However, I roused myself at once. God, if it is so hard for me, an adult woman, then how hard it must be for children, teenagers, who became orphans in a fraction of second," she recalls. There are happy ends here. About 10 years ago Vehanush was told that there was a seven year old, very dirty and rude boy, who was drinking vodka from the bottle at the square near the railway station and who was earning money for bread and vodka by singing songs in commuter trains from Gyumri to Artashat. It turned out that the boy's mother was in prison for committing theft and his father went to Russia and left the child at the mercy of fate. "I won't tell you how hard it was to reeducate him, what kind of terrible curses he was showering upon us while we were trying to head him off the wrong way," Vehanush says. "Probably in this case it was again the art that helped. Once he heard my song "Mayrik" ("Mother") and he wished to sing it. Then he recorded it and sent it to prison for his mother." Vehanush doesn't want to tell his name because now he works in the best hotel of Gyumri and leads a dignified life. Journalists at of one of the oldest newspapers of Armenia "Banvor Kumayri" (more than 80 years) were also talking about dignified life in the newsroom. Fourteen employees of that newspaper died under ruins. 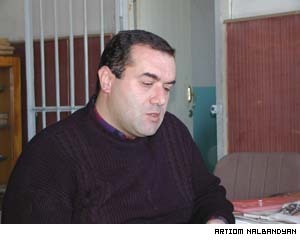 The editor, Aghasi Abrahamyan was outside the building during the earthquake, he was head off to do a story about a furniture factory. The factory and the newsroom were ruined. Some 7,000 families in Guymri are still waiting for new apartments. Today the newsroom is not equipped at all. In the middle of the room, a wood-burning stove is the centerpiece around which meetings are conducted. Asked what the paper will report on this 15th anniversary, Abrahamyan says there'll be the usual flow of unsolicited poems. "And of course, we will write about changes that have taken place in the life of the city since the day of the earthquake." Abrahamyan agrees that time heals. However, he believes that it could heal quicker if living conditions were better. It's hard to find a family in Gyumri, which was passed over by misfortune caused by the disaster. It's hard to meet someone here who didn't experience the pain of loss. "We just try not to talk about it as we don't want to deject each other's spirits," Aghassi says. Reporters of "Banvor Kumayri" cover the topics concerning construction with pleasure. Thanks to "Lincy" Foundation residents of Gyumri, Akhurian, Vanadzor, Spitak, Stepanavan and Gugark were given keys to 3,674 new apartments in recent years. The puppets also talk about construction. "Your city is pretty dusty," says the lady from abroad, sneezing. "It is not 'that' dust, sister-jan. It is dust caused by construction. We are ready to bear this dust with great happiness," explains Master Mukuch. And addressing the lady he asks, "Listen, may be you know Lincy? I've been looking for him or her (I don't know whether Lincy is man or woman) for a long time as I want to kiss his or her forehead and tell big words of Gyumri thanks." Today about 7,000 families more are waiting for the keys in Gyumri. Some people say that some of those who were provided with comfortable apartments, are not in a hurry to leave their temporary sheds. According to governmental decision No. 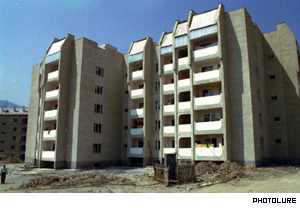 432 of 1999, housing space distribution is based on the principle of compensation for the lost. However, during these years some families compensated their casualties over and above. For instance, Karineh Baghdasaryan's family consisted of five members before the earthquake and could live in two-room apartment. But now there are eight members in her family. That's why they still live in their domik - because it has three rooms. Anyway, the ivory, soft-pink, and light brown residences changed the mood of people living in the disaster zone. Today, the level of despair has lifted. Lacking, yet, is optimism, however, because the second major problem after housing is employment. "It's good to have an apartment but we can't sit there doing nothing. 'Lincy' cannot take care of feeding our children and equipping our new apartments," says Gyumri resident, 42 year old Svetlana Kazaryan. Workers of "Banvor Kumayri" talk about the same. "There are no industrial establishments in Gyumri and there are very few jobs. Only small and retail businesses are functioning. And, of course, thanks God, construction works are in process. Thanks to these works 4,000-5,000 people are employed. Hopes of people are connected only with construction," says reporter Anahit Norikyan. Abrahamyan, reminding that all attempts to launch production in Gyumri have failed, brought an example of a sugar factory. "Six years ago Minister of Agriculture Mr. Zadoyan buried a bottle of champagne into the footing of a building that was to become a factory. The territory had already been allotted and there was also a project for $80 million. However, the champagne was the only thing to come from the future plant." Another topical problem for the city that has entered the winter is heating. Residents of the 58th block say they are doomed to freeze because the housing complex of more than 5,000 apartments won't be supplied with gas. This year, authorities decided to decentralize the area heating system, but because of a lack of money were not able to provide boilers for each district. "Probably people won't endure in these cold concrete buildings and will have to leave their apartments and reside for a time in apartments of their relatives and friends, who live in other parts of the city," says Abrahamyan. For 14 years, with the approach of December 7 state officials, political and public figures, and media have deemed it a duty to publicly commemorate Spitak earthquake that killed more than 25,000 and left thousands more without shelter. "Disaster zone" became part of our vocabulary. Those days we didn't know that soon the whole country would be a zone of suffering -- the war in Karabakh, the energy crisis and hungry, cold winters took a toll. It seemed that "December" would never end. But even during those terrible years nobody forgot about the Spitak earthquake. Commemoration was accurately observed on the state level, however, they tried not to visit victims of the disaster. There was no sense to do that with empty hands, without concrete projects on reconstruction. Those days press often wrote, "it is immoral to recall about the zone only once a year on December 7 consigning them to oblivion during the other 364 days." The task to transform a disaster zone into a zone of development became concrete only during recent years. Construction of buildings, restoration of cultural centers in the zone and as a result transformation of the city is a claim for the new life. 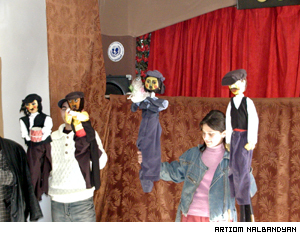 Puppets, mastered by a new generation of Gyumri residents and grown after the earthquake, talk about it as well. "We've had enough of grieving and frowning. Let God give power to Gyumri people and we will make our wonderful city more wonderful. So, let's try to have fun already." It seemed that the vital dance melody following these words must have driven away all doubts and grief. However, the strange thing is that the more Gyumri people joke, the more they become sad and their souls become more emotional because of reminiscences of black December.